The following section accounts the interaction of slowly propagating dissipative solitons by means of a particle ansatz and a nonlinear perturbation analysis. This approach results into a reduction of the field dynamics to the position and excitation of the respective propagator mode where the interaction between dissipative solitons can be regarded approximately as classical central force. Starting from the reduced dynamics, scattering and the formation of bound states are investigated and compared to solutions of the underlying reaction-diffusion system, which shows good agreement between field and particle model. Also on basis of the reduced dynamics and under consideration of internal degrees of freedom the dynamics of rotating bound states are investigated which leads to the description of centrifugal forces and related distance dependent angular velocities. 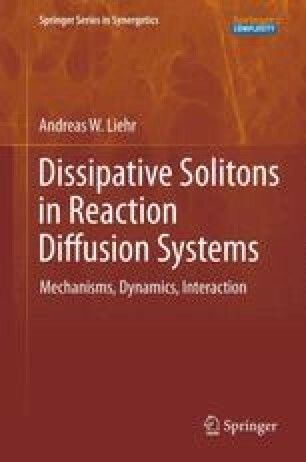 The chapter finishes with some general considerations on many-particle systems of dissipative solitons. P. Rogerio Josepho Boscovich, 1763 [5.1], cited from [5.2].